The St. Louis Cardinals system went 2-2 on Wednesday. Center fielder Oscar Mercado, our Player of the Day, plated three for Memphis and starter Zach Prendergast pitched Peoria to a win. Springfield and Palm Beach dropped road contests. Recaps from games played on Wednesday, May 23. A three-run outburst in the first inning proved to be all that was needed for the Redbirds, as they cruised to a 7-2 win over the visiting Dodgers. First baseman Luke Voit, shortstop Wilfredo Tovar, and left fielder Randy Arozarena each drove in a run in the first. As the game progressed, center fielder Oscar Mercado took the lead in run manufacturing. Mercado, our Player of the Day, was 3-for-5 with three runs batted in, including two on his sixth home run of the season. Kevin Herget improved his record to 2-4 after turning in a quality start of one-run ball over six innings. Herget fanned six Dodgers and allowed four hits, walking one batter. Hector Mendoza posted zeros in the seventh and eighth innings before Arturo Reyes allowed a run in the ninth while recording the final three outs. Thursday’s game: Alex Reyes (MLB rehab) vs. Oklahoma City Dodgers, 7:05 PM Central time. On a night in which they mustered a mere three hits, the Cardinals fell in Corpus Christi to the Hooks by a 4-2 score. Shortstop Tommy Edman hit his second homer in the third inning, and designated hitter Granden Goetzman drove in first baseman Chris Chinea with a base hit in the eighth, after Chinea reached via a single. Aside from that, the Cardinals offense was lacking. The team had just two at-bats with runners in scoring position, but to look on the bright side, only two runners were stranded. Cardinals starter Conner Greene allowed three runs over 5 1/3 frames and dropped to 4-3 as he was tagged with the loss. It was only the third of nine starts this year that he did not log at least 5 2/3 innings. In relief, Estarlin Arias allowed a run in 1 2/3 innings, and Ramon Santos tossed a scoreless eighth. Thursday’s game: Jake Woodford (2-5, 4.66) at Corpus Christi Hooks, 7:05 PM Central time. With seven runs from the sixth inning on against Palm Beach’s bullpen, the Flying Tigers defeated the Cardinals by an 8-4 score. Cardinals starter Casey Meisner pitched five innings, allowing two runs on as many walks and four hits. Meisner was in line for a win when he departed, but ultimately did not factor in the final decision. Jason Zgardowski allowed one run in both the sixth and seventh, but Eric Carter wore the loss. Still in the seventh, Carter entered a 4-4 game, and retired one batter before surrendering a two-run home run to Lakeland center fielder Daz Cameron, his second of the evening. Two more insurance runs came home in the eighth against John Kilichowski. Though the Cardinals scored four runs on seven hits from six different players, the lineup collectively struck out 12 times and stranded 10 runners. Left fielder Shane Billings had two hits in four at-bats, highlighted by an RBI single in the third. Third baseman Danny Hudzina hit his first double for Palm Beach and scored two runs. Thursday’s game: TBA vs. Clearwater Threshers, 5:30 PM Central time. Led by a strong start from Zach Prendergast and just enough run production, the Chiefs enjoyed a 6-5 victory over the Snappers in Beloit. Prendergast turned in his third consecutive quality start, this one a two-run, six-inning performance. The 23-year old right-hander fanned four Snappers and picked up his fifth win in seven decisions this season. Reliever C.J. Saylor allowed a three-run homer in the bottom of the seventh that closed the gap to 6-5. Bryan Dobzanski danced around four hits yielded in the eighth and ninth innings to hold serve and notch his third save of the year. 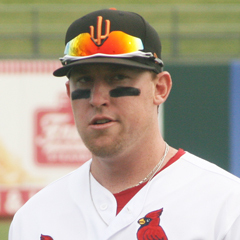 Chiefs first baseman Zach Kirtley had three hits including a double and scored a run. Leadoff hitter and center fielder Scott Hurst was 2-for-5 with a pair of two-base hits, and catcher Dennis Ortega went 2-for-4 with two runs scored and two runs batted in on his second home run of the season. Designated hitter Matt Fielder also had two hits and two RBI. Thursday’s game: Jake Walsh (2-1, 3.12) at Beloit Snappers, 6:30 PM Central time. 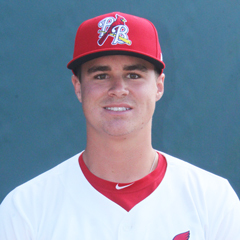 The St. Louis Cardinals system was 2-2 on Sunday as Player of the Day Dakota Hudson and Evan Guillory sparked Memphis and Peoria to wins. Springfield dropped a home twin-bill to slide into second place and Palm Beach was unable to play for the second straight day. Recaps from games played on Sunday, May 20. Powered by another quality start from Dakota Hudson and offensive contributions throughout the batting order, the Redbirds cruised to a 6-1 win over the Sky Sox in Colorado Springs. Memphis (26-18) took three of four in the weekend series. Hudson, our Player of the Day, improved to 5-1 on the season with six frames of work, during which he allowed one run and fanned seven. With only 66 strikes out of his 106 pitches, Hudson walked four batters and was aided by the defense, as the Redbirds turned two double plays. Preston Guilmet logged two scoreless innings in relief before Edward Mujica posted a zero in the ninth. Shortstop Alex Mejia led the way with three hits, while center fielder Oscar Mercado, third baseman Patrick Wisdom, and catcher Andrew Knizner each had two. First baseman Rangel Ravelo, left fielder Randy Arozarena, and Wisdom scored two runs apiece, and second baseman Max Schrock, right fielder Adolis Garcia, Mercado, Wisdom, Mejia, and Knizner each batted in a run. The Redbirds combined to go 4-for-13 with runners in scoring position. Monday’s game: Austin Gomber (2-3, 4.61) vs. Oklahoma City Dodgers, 6:35 PM Central time. With two runs in each of the third, fourth, and fifth innings, the Naturals were 6-3 winners in the opening game of Sunday’s doubleheader. Cardinals starter Connor Jones allowed four runs on nine hits – all earned – and picked up the “L”. Yeison Medina worked an inning and allowed a run before Landon Beck pitched 2 1/3 frames of scoreless relief. Edmundo Sosa, the second baseman, went 3-for-4 with a two-run homer. Right fielder Blake Drake batted in the Cardinals’ third run. With three runs in the first inning, the Naturals were 4-1 winners over the Cardinals in the second game of Sunday’s doubleheader at Hammons Field. It was the reschedule of the April 25 postponement. Spot starter Jacob Evans worked five innings of three-run ball. Evans fanned six batters, but dropped to 0-3 on the year with the loss. Springfield’s only run of the game was driven in by Sosa, the shortstop in the second game. With the pair of Sunday losses, the 22-21 Cardinals have fallen to second place, a half-game behind Tulsa. Monday’s game: Chris Ellis (2-0, 4.33) vs. Northwest Arkansas Naturals, 11:10 AM Central time. For the second straight day, weather stopped play at Roger Dean. The Sunday doubleheader between the Bradenton Marauders and Cardinals was cancelled due to wet grounds. As the clubs do not play again in the first half, it will not be rescheduled. The Cardinals will play in Lakeland against the Tigers on Monday, with Austin Warner (2-1, 3.48) taking the mound at 5:30 PM Central time. Thanks to eight frames of one-run ball from Evan Guillory and a Peoria run in each of the final three frames, the Chiefs enjoyed a 3-2 comeback extra-innings win over the Cougars at Dozer Park on Sunday. Guillory’s lone blemish was a solo homer in the top of the fourth inning. Guillory fanned seven batters his second start of eight innings this year. Levi MaVorhis pitched a scoreless ninth but allowed a run in the 10th, and Bryan Dobzanski picked up his second win of the year after posting a zero in the 11th. The trio held Kane County to just four hits. A sacrifice fly from shortstop Jose Martinez tied the game in the bottom of the ninth, as center fielder J.R. Davis scored. First baseman Zach Kirtley’s RBI single in the 10th tied the game at two runs apiece, following Kane County’s run in the top of the inning against MaVorhis. With the score still knotted at two, Martinez popped another sacrifice fly in the bottom of the 11th, bringing in Davis again for the game-winning run. Davis paced the offense with three hits and two runs scored on the afternoon. 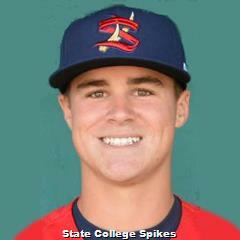 Monday’s game: Paul Balestrieri (4-2, 3.24) at Beloit Snappers, 6:30 PM Central time. 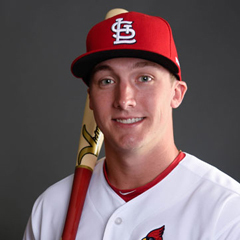 The St. Louis Cardinals system was a perfect 3-0 on Wednesday behind strong pitching from Springfield’s Ryan Helsley, Palm Beach’s Ian Oxnevad and Peoria’s Paul Balestrieri. Recaps from games played on Wednesday, May 16. The Redbirds were off Wednesday as they travel to Colorado Springs, Colorado. There, they will begin a series with the Sky Sox on Thursday evening at 7:40 PM Central time. Kevin Herget (1-4, 3.96) will take the mound for Memphis. With back-to-back homers in the fourth to complement a dazzling outing from the starter, the Cardinals enjoyed a 2-1 victory in Tulsa over the Drillers. 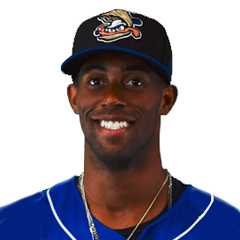 To lead off the fourth inning of what was then a scoreless game, Springfield left fielder Randy Arozarena smacked his fourth home run with Springfield, his second in two days and third in the last week. Center fielder Lane Thomas followed with a long ball of his own, his ninth of the year. The two runs were it for the Cardinals on Wednesday, but they were all that Ryan Helsley needed. Helsley, our Player of the Day, twirled 7 2/3 innings, his longest outing of the season and first of more than six innings. An unearned run was the only blemish for Helsley, who picked up his third win of the year. The 23-year old fanned seven batters, walked only two, and surrendered just a pair of singles. Hector Mendoza recorded the game’s final four outs to protect the win for Helsley and earn his fourth save. Thursday’s game: Conner Greene (3-2, 3.63) at Tulsa Drillers, 7:05 PM Central time. Powered by five runs over the first three innings, Palm Beach cruised to a 5-2 road win over the Threshers. 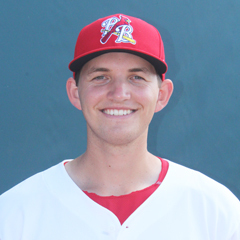 Cardinals right fielder J.B. Woodman and left fielder Shane Billings each homered (Woodman’s was a two-run shot and Billings’ a solo), their third and first of the year, respectively. Center fielder Johan Mieses and second baseman Andy Young batted in Palm Beach’s other runs, and third baseman Evan Mendoza finished the day with three base hits. 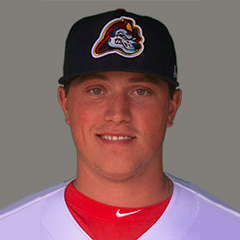 Ian Oxnevad pitched a whale of a game for the Cardinals, shining over his eight frames of two-run ball. It equated to the lefty’s third win of the season and first quality start in six tries. John Kilichowski recorded one out for his first hold, and Austin Sexton locked down the final two for his fourth save. Thursday’s game: Anthony Shew (3-1, 1.67) at Clearwater Threshers, 6:00 PM Central time. A six-run rally in the bottom of the eighth inning propelled the Chiefs to a 7-5 comeback victory over the LumberKings at Dozer Park. Peoria’s seventh straight win powered them into first place. Trailing 5-1, Peoria scored a half-dozen times via 10 plate appearances in the big inning. Five hits, two walks, and a wild pitch helped the Chiefs get there, and it was Matt Fiedler’s two-run, two-out triple that broke the tie and put Peoria ahead for good. For the game, the Chiefs went 5-for-14 with runners in scoring position, stranding five. Scott Hurst and J.R. Davis (two runs scored) had two hits apiece. 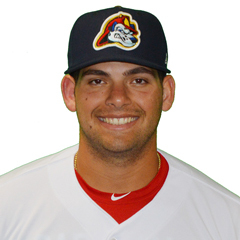 Alvaro Seijas labored in his start, which lasted only 3 2/3 innings. With a pitch count of 90, Seijas allowed nine hits and walked four batters, which the LumberKings translated to five earned runs. C.J. 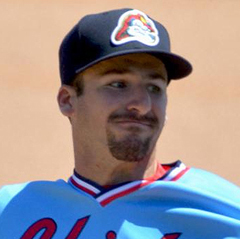 Saylor retired four batters to pitch the Chiefs through the fifth inning before Paul Balestrieri logged four scoreless frames on just two hits and no walks to earn the win in his Peoria debut. Thursday’s game: Zach Prendergast (2-2, 5.29) vs. Clinton LumberKings, 6:30 PM Central time. 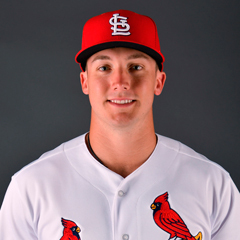 During the 0-2 Mother’s Day in the St. Louis Cardinals system, Memphis’ Tyler O’Neill continued his home run-hitting ways while Springfield’s Jake Woodford yielded just one unearned run in six innings. Recaps from games played on Sunday, May 13. With seven runs over the final three innings, the Sounds pulled away to an 8-3 win over the Redbirds in Memphis. It was the 22-16 Redbirds’ fourth straight defeat and eighth in their 11 games this month. After starter Sean Gilmartin turned in 5 2/3 innings of one-run ball, Mike O’Reilly was called upon out of the bullpen. With three runs allowed in the seventh, one in the eighth, and three more in the ninth, O’Reilly was charged with seven runs (five earned) in 3 1/3 frames. It was his first loss and blown save since joining the Redbirds on May 6. Memphis had nine hits in their losing effort, but had just four opportunities with runners in scoring position and converted one. Redbirds right fielder Tyler O’Neill, our Player of the Day, went 2-for-4 with a double and a home run, his 11th long ball of the season and second in two days. Third baseman Alex Mejia singled three times and scored. Monday’s game: Dakota Hudson (3-1, 3.03) vs. Nashville Sounds, 11:05 PM Central time. With an unearned run in the bottom of the fifth, the Travelers skimmed by the Cardinals for 1-0 win on Sunday. Jake Woodford started for Springfield and pitched very well. In his six innings, Woodford limited the Travelers to six hits, a walk and just the one run, which was unearned due to a Tommy Edman error at third base. Woodford recorded five strikeouts, but nevertheless, was tagged with the loss and dropped to 2-4 on the season. In relief, Jacob Evans tossed two perfect innings. Springfield mustered a mere four hits, with right fielder Blake Drake’s sixth double of the season accounting for the Cardinals’ only extra-base hit. Second baseman Ramon Urias, designated hitter Randy Arozarena, and first baseman Luke Dykstra each had a base hit. Arozarena stole his fifth base with Springfield. Monday’s game: Connor Jones (2-0, 4.97) at Tulsa Drillers, 7:05 PM Central time. The high-A Cardinals were off Sunday and will pick back up on Monday in Clearwater. Palm Beach has not announced who will take the mound against the Threshers in the 6:00 PM Central time start. The Midwest League Chiefs were off Sunday and have returned home in Peoria to begin a series with the Clinton LumberKings on Monday. Alex Reyes will make his second rehab start, first at Peoria, with the first pitch scheduled for 6:30 PM Central time. 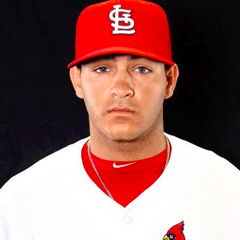 The 2-1 Wednesday across the St. Louis Cardinals system included a dominating win by Jack Flaherty and Memphis plus two extra-innings games, which Peoria won and Palm Beach lost. St. Louis prospect Alex Reyes passed his first rehab test. The two standout pitchers may soon be in competition for a big-league rotation spot. Recaps from games played on Wednesday, May 9. Powered by Jack Flaherty’s dominant outing and offensive production throughout the lineup, the Redbirds enjoyed a 7-2 win over the Dodgers in Oklahoma City. Flaherty, our Player of the Day, fanned a career-high 13 batters in 6 2/3 innings, during which he held the Dodgers to two runs. Picking up the win, Flaherty improved to 4-1 on the season with Memphis. Andrew Morales and Edward Mujica combined for 2 1/3 scoreless innings of relief to polish out the victory. The Redbirds collectively went 4-for-12 with runners in scoring position and benefited from solo homers from second baseman Wilfredo Tovar and left fielder Adolis Garcia. First baseman Luke Voit went 4-for-5 including three doubles, two runs batted in, and two runs scored. Shortstop Yairo Munoz and right fielder Tyler O’Neill batted in a run each, and center fielder Oscar Mercado scored twice. Thursday’s game: Austin Gomber (2-1, 3.19) at Oklahoma City Dodgers, 7:05 PM Central time. The Double-A Cardinals were off Wednesday as they travel to Little Rock for a series with the Arkansas Travelers. That set will open on Thursday evening at 7:10 PM Central time with Chris Ellis (2-0, 2.03) as Springfield’s starting pitcher. With nine runs in the 10th inning, the Hammerheads put an emphatic end to what was a 1-1 tie through the first nine innings against Palm Beach. Jupiter won the game by a 10-2 final score. Alex Reyes made his first official rehab appearance as Palm Beach’s starter. Reyes logged 3 1/3 innings, throwing 43 strikes in 67 pitches, shutting the Hammerheads out on four hits and one walk with six strikeouts. Editor’s note: I was in attendance and was impressed with the sharpness of his varying offerings. My only concern is an ongoing one with Reyes, and that is pitch efficiency. Ideally, he would have gone five innings on 67 pitches. 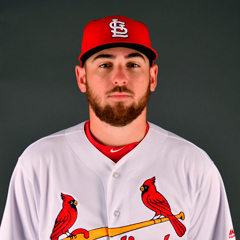 His next start will be in Peoria in five days before moving on to Springfield, Memphis and St. Louis, where he could soon be in a competition with Flaherty for the next rotation opening. Reyes showing all his pitches in the first including several 99mph fastballs. Gave up double on cutter at 89. 2 Ks including 81 mph curve. Regular starter Ian Oxnevad took the mound after Reyes and went six innings – the first five scoreless. Oxnevad retired just one batter in the 10th, and Austin Sexton was called up to record the final outs. Oxnevad was charged with six runs (five earned), and Sexton surrendered four earned runs in the fateful frame. In the inning, the Hammerheads drew three walks and had six hits. The Cardinals stranded 10 runners on Wednesday, with only two hits with runners in scoring position. Catcher Jose Godoy and left fielder Shane Billings each had two hits; first baseman Stefan Trosclair and right fielder Dylan Carlson scored one run apiece. Center fielder Johan Mieses walked twice, accounting for two of Palm Beach’s five free passes. Thursday’s game: Anthony Shew (2-1, 1.99) at Bradenton Marauders, 5:30 PM Central time. After plating a run in the ninth to tie the game, the Chiefs scored the go-ahead tally in the top of the 10th to defeat the Hot Rods, 5-4, in Wednesday’s series finale. 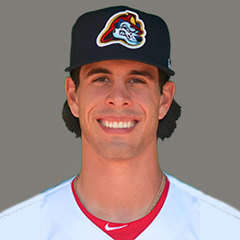 Alvaro Seijas started for the Chiefs and turned in five innings of three-run ball. Seijas gave up nine hits and walked three batters but was helped by a double play and the Hot Rods’ lack of timely hitting: Bowling Green had just one hit out of 13 at-bats with runners in scoring position, stranding a dozen runners on the bases. Bryan Dobzanski allowed one run across two frames in relief of Seijas, and Kodi Whitley improved to 3-0 on the year with three scoreless frames to close out the win. Chiefs catcher Dennis Ortega had three base hits, and third baseman Elehuris Montero scored three runs. Second baseman Irving Lopez knocked in the tying run with a one-out single in the ninth as part of his 2-for-4 day. Right fielder Bryce Denton was credited with the game-winning RBI, as his fielder’s choice drove in Peoria’s fifth and final run. Thursday’s game: Zach Prendergast (3-1, 2.65) at Dayton Dragons, 6:00 PM Central time. 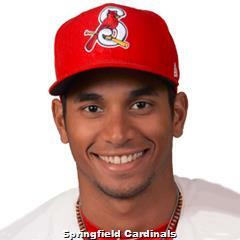 On a 1-2 Sunday across the St. Louis Cardinals system, late home runs from Victor Roache and Ramon Urias powered Springfield to a comeback win. Memphis and Peoria took losses and Palm Beach was rained out. The Sounds’ offense was clicking on Sunday, leading to Nashville’s 8-2 victory over visiting Memphis. The Redbirds have lost four consecutive games. Kevin Herget started and turned in five innings, surrendering five runs, though he fanned a season-high eight batters. Charged with the loss, Herget dropped to 1-3 on the year. 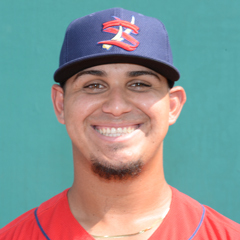 Andrew Morales followed with two perfect innings with five strikeouts before John Brebbia allowed three runs on two homers in the eighth inning. The Redbirds matched the Sounds with nine hits, however Memphis managed just one hit in eight at-bats with runners in scoring position, and that resulted in a count of eight stranded runners. Center fielder Adolis Garcia doubled twice and scored, and right fielder Tyler O’Neill added a solo home run in the third inning. It was O’Neill’s eighth home run this year and the second in this current series against the Sounds. Monday’s game: Daniel Poncedeleon (1-2, 2.39) at Nashville Sounds, 12:05 PM Central time. A pair of timely home runs late powered Springfield to an 8-6 comeback victory over the Drillers, the Cards’ third win in a row. 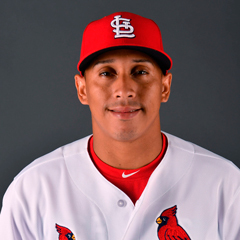 Cardinals third baseman Ramon Urias highlighted a four-run sixth with a three-run long ball, his second homer of the season. With the score knotted at six runs apiece, Springfield outfielder Victor Roache launched his 10th home run of the year, a two-run shot that put the Cardinals ahead. Roache, our Player of the Day, has homered in each game of Springfield’s winning streak and six times since April 30. Starter Connor Greene allowed two runs in 3 2/3 innings, but got in to trouble with seven walks. Ramon Santos recorded four outs in relief and surrendered three runs, and Yeison Medina allowed a solo home run in his lone frame of work. Hector Mendoza secured his first win of the year with three scoreless frames, complemented by six punchouts. Monday’s game: Adam Wainwright (MLB rehab) vs. Tulsa Drillers, 11:10 AM Central time. Sunday’s game between the Palm Beach Cardinals and St. Lucie Mets was cancelled due to rain. As this was the last matchup between the two clubs in the first half, the game will not be rescheduled. 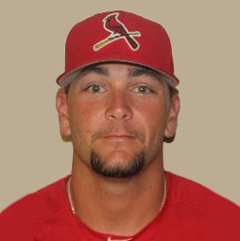 Casey Meisner (0-1, 4.00) will start on Monday when the Cardinals host the Jupiter Hammerheads at 5:30 PM Central time. With five runs in the third inning, the Cubs took Sunday’s series finale in Peoria by a 5-4 final score. South Bend manufactured their crooked-number frame against Chiefs starter Jake Walsh, who ultimately logged seven innings on Sunday. Walsh surrendered five hits – including a three-run homer – in the third inning but was otherwise solid. Walsh struck out five batters and walked two, throwing 92 pitches. The right-hander’s record evened at 1-1 with the loss. 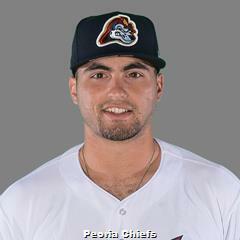 Second baseman Irving Lopez again led Peoria’s offensive effort with a 2-for-5 day, featuring a two-run homer and a total of three runs batted in. Designated hitter Juan Yepez had a base hit and scored a run, and first baseman Yariel Gonzalez was 2-for-4 with a double. The Chiefs combined to outhit the Cubs, 10-6, nonetheless Peoria was just 2-for-9 with runners in scoring position and stranded seven. Monday’s game: Johan Oviedo (1-2, 6.45) at Bowling Green Hot Rods, 6:35 PM Central time. On a 2-2 Sunday across the St. Louis Cardinals system, Ryan Helsley’s 2018 Memphis debut was memorable. Other standouts include Rangel Ravelo, Chris Chinea and Evan Kruczynski. Recaps of games played on Sunday, April 29. Supported by a great outing from their starting pitcher and an offense that flowed, the 17-7 Redbirds enjoyed a 6-1 home victory over the Express on Sunday. 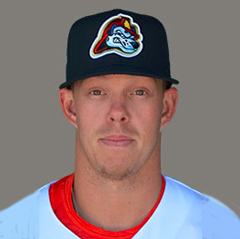 Ryan Helsley, our Player of the Day, twirled seven innings in his first Triple-A start of 2018, holding Round Rock to one run with nine punchouts. Ryan Sherriff pitched a clean eighth inning in his second rehab outing, and Preston Guilmet logged a scoreless ninth. #STLCards pitching prospect Ryan Helsley was overpowering in his season-debut for the @memphisredbirds today: 7 IP, 4 H, 1 ER, 1 BB, 9 K. He threw 98 pitches, 73 for strikes and touched 99 mph on the gun. Memphis scored one run in the third inning, four in the sixth, and one in the eighth. First baseman Rangel Ravelo’s three-run homer highlighted the day for the batting order. Right fielder Oscar Mercado went 3-for-4 and scored a run, and third baseman Alex Mejia hit his first home run of the season. Monday’s game: Kevin Herget (1-1, 2.61) vs. Oklahoma City Dodgers at 6:35 PM Central time. With nine runs scored from the seventh inning on, the Travelers handed the 12-9 Cardinals a 12-4 loss in Springfield. Cardinals starter Chris Ellis turned in a quality start of six innings with three runs allowed. The right-hander fanned seven Arkansas batters and limited the club to four hits. Ronnie Williams pitched the seventh and was tagged for five runs – four on a grand slam and the other on a solo shot. Landon Beck tossed a scoreless eighth before allowing four runs in the top of the ninth. Springfield first baseman Chris Chinea had two hits in four trips to the plate, including a two-run homer. Third baseman Edmundo Sosa had two hits, and shortstop Tommy Edman drew two walks. The team combined to go just 2-for-12 with runners in scoring position, stranding nine base runners. Monday’s game: Ramon Santos (0-1, 5.59) vs. Arkansas Travelers at 11:30 AM Central time. With a five-run seventh, the 13-11 Cardinals put away the Mets by an 8-6 final score in Sunday’s road contest. Evan Kruczynski improved to 3-0 on the year after turning in 5 1/3 innings with one run allowed. The Mets scored three runs (one earned) charged to Jacob Patterson and another against Jason Zgardowski before Austin Sexton picked up a two-inning save. Sexton allowed one hit in two otherwise-perfect frames. Cardinals third baseman Evan Mendoza was 2-for-4 at the dish with two RBI and as many runs scored. Right fielder Dylan Carlson scored twice, and left fielder Chase Pinder knocked in a pair of runs with a double. Next game: TBA at Florida Fire Frogs, Tuesday at 5:30 PM Central time. 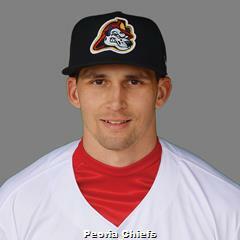 The Chiefs could not overcome an early deficit and fell to the Timber Rattlers in Wisconsin, 9-5. The 10-11 Chiefs dropped the series finale as well as the set, concluding a 2-5 road trip. The Timber Rattlers got to starter Winston Nicacio for seven runs – all earned – on as many hits and two walks in his 2 1/3 innings of work. Cory Malcom followed with two runs across his 2 2/3 frames before Bryan Dobzanski and Fabian Blanco combined to fire three scoreless frames at the back end of the game. Peoria backstop Julio Rodriguez and right fielder Scott Hurst were both 3-for-5 with a pair of runs batted in, and third baseman Elehuris Montero and designated hitter Juan Yepez each had a pair of hits. The latter raised his average to .438 and extended his on-base streak to 14 games. Next game: Jake Walsh (1-0, 1.61) at West Michigan Whitecaps, Tuesday at 6:30 PM Central time. 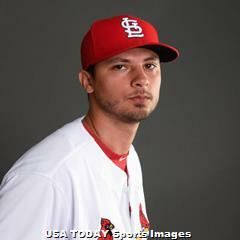 Two rainouts and two losses turned Wednesday into a downer for the St. Louis Cardinals system. Casey Meisner struggled in his organizational debut, but Peoria first baseman Juan Yepez had a four-hit night, raising his season average to .443. Recaps of games played on Wednesday, April 25. Due to a rain-filled forecast, the Redbirds game against the Round Rock Express on Wednesday in Memphis was postponed. The game will be made up on Thursday as part of a doubleheader that will begin at 5:05 PM Central time. Daniel Poncedeleon (1-1, 1.06) will start the opener, and St. Louis rehabber Sam Tuivailala will take the ball in the nightcap in what may be a bullpen game. Like the Triple-A Redbirds, the Double-A Cardinals game against the Northwest Arkansas Naturals in Springfield was postponed due to rain. The game will be made up as part of a doubleheader on Sunday, May 20, the first of consecutive seven-inning games. The two clubs will wrap up their series on Thursday at 7:10 PM Central time. Conner Greene (2-1, 2.63) will take the ball for Springfield. Carried by their five-run third inning, the Jupiter Hammerheads enjoyed a 6-2 win over Palm Beach at Roger Dean Stadium on Wednesday. 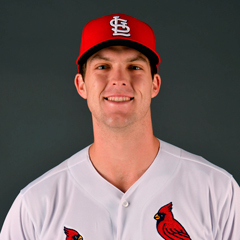 In his Cardinals organization debut, Casey Meisner started and allowed five runs across his three innings of work. Six walks and three extra-base hits – including a three-run homer in the third – led to Meisner’s quick departure. Jacob Patterson followed with 2 2/3 innings of scoreless ball, and Jason Zgardowski pitched 2 1/3 of the same variety. Will Latcham surrendered an unearned run in the ninth and struck out two batters. The Cardinals matched the Hammerheads in the hit column with eight but were unable to use them as effectively. Shortstop Kramer Robertson went 3-for-4, stole a base and scored out of the leadoff spit, and catcher Brian O’Keefe also came home. O’Keefe hit his third double of the season, and center fielder Chase Pinder added his second two-base hit. The Beach Birds combined to go 3-for-12 with runners in scoring position, stranding eight runners. Former Cardinal Daniel Castano picked up the win for Jupiter, allowing two runs over six innings. The Hammerheads lineup included two rehabbing Major Leaguers, third baseman Martin Prado and shortstop J.D. Riddle, both of whom went 1-for-3 with a run scored. Thursday’s game: Austin Warner (0-2, 7.82) at St. Lucie Mets, 5:30 PM Central time. The hometown Snappers came away on top of Wednesday’s offense-heavy matchup with the Chiefs. Backed by their five-run rally in the seventh against the shaky Peoria bullpen, Beloit prevailed by a 9-8 final score. The Chiefs’ third consecutive one-run loss dropped their season record to 8-9. Johan Oviedo toed the rubber for Peoria and turned in a quality outing. The 6-foot-6 right-hander went six frames and limited the Snappers to three runs with zero walks and five strikeouts. Levi MaVorhis ran into trouble in relief, recording just one out while being charged with four runs – three earned. Bryan Dobzanski allowed an unearned run in his 1 2/3 innings and was charged with his first blown save of the year. Kevin Hamann surrendered the walk off single with two outs in the ninth and dropped to 0-2 on the season with an 11.55 ERA. It was not a subpar night for the Chiefs’ batting order, a group that went 5-for-15 with runners in scoring position and had four extra base hits. First baseman Juan Yepez, our Player of the Day, highlighted Peoria’s box score with a 4-for-5 evening, including his seventh double of 2018 and two runs scored. Designated hitter Elehuris Montero and left fielder Bryce Denton each had two hits, including a double. Yepez, Montero, and Denton each plated a pair. 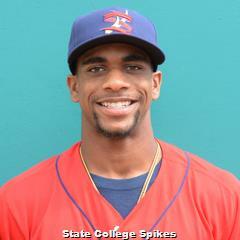 Thursday’s game: Evan Guillory (1-1, 2.20) at Beloit Snappers, 6:30 PM Central time. 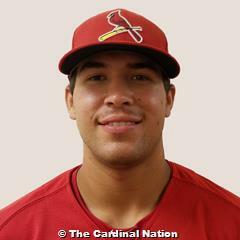 Springfield’s Andrew Knizner is our Sunday Player of the Day across the 2-2 St. Louis Cardinals system. The catcher doubled twice, increasing his Texas League-best batting average to .429. Results of games played on Sunday, April 22. It took 12 innings, but the Redbirds came away from Sunday’s contest as 8-6 road winners over the Cubs – despite the bullpen twice blowing save opportunities. 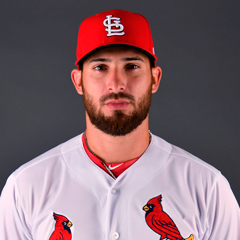 Redbirds left fielder Rangel Ravelo had three hits in six plate appearances with two runs batted in, including one on a sacrifice fly and Memphis’s final run of the game in the top of the 12th inning. In that frame, first baseman Luke Voit drew a bases-loaded walk and was credited with the go-ahead RBI. Oscar Mercado hit his third home run of the season and stole two bases – his eighth and ninth of the year. The Redbirds had many more chances, going 4-for-13 with runners in scoring position and stranding 11 runners. Starter Dakota Hudson pitched 5 1/3 innings of three-run ball with six strikeouts. After Derian Gonzalez finished the sixth and pitched the seventh and eighth innings, Preston Guilmet surrendered a game-tying home run in the bottom of the ninth. After the Redbirds jumped ahead in the top of the 10th inning, Guilmet allowed the tying run in the bottom half of the frame for a blown save. When the Redbirds pulled ahead for good in the 12th inning, Edward Mujica was the pitcher of record. Mujica – who surrendered the lead in the 11th – blew his first save of the year and won his second game. Across 1 1/3 innings, Mujica fanned three batters. Monday’s game: Austin Gomber (1-0, 3.57) at Iowa Cubs, 12:08 PM Central time. With seven runs across the fifth and sixth innings, the Travelers sprinted to a 9-3 victory over the visiting Cardinals. Springfield starter Jake Woodford allowed six runs in his 4 1/3 innings. Three came on a home run, and two of the right-hander’s four walks came around to score. Taking the loss, Woodford dropped to 1-2 on the season. Jacob Evans was tagged for three more runs in the sixth before Tyler Bray pitched 2 2/3 innings of clean baseball, when it was too late. The Cardinals had just three hits in 14 at-bats with runners in scoring position and left nine on base. First baseman John Nogowski batted in two, and left fielder Victor Roache drove in the other. Shortstop Ramon Urias went 4-for-4 including two doubles. Clean-up hitter Andrew Knizner did his part. Our Player of the Day went 2-for-4 with a pair of doubles and scored twice. The two-base hits are the catcher’s fourth and fifth this season as he raised his season average to .429, tops in the Texas League. Monday’s game: Chris Ellis (0-0, 0.93) vs. Northwest Arkansas Naturals, 6:30 PM Central time. At least the Beach Birds did not give up, as they scored eight unanswered runs from the sixth inning onward, but the rally was not enough to overcome the 10 runs the Stone Crabs scored in the early going. After a fast start to the season, Palm Beach suffered its fourth consecutive loss, falling to 9-8 overall. Anthony Shew went 3 2/3 innings in his start and allowed six runs on eight hits. With a couple of errors while he was on the mound, Jason Zgardowski surrendered four unearned runs in his 1 1/3 relief frames before Jacob Patterson and Ronnie Williams posted zeroes across the final three innings. On the offensive side, first baseman Ryan McCarvel, catcher Brian O’Keefe, and shortstop Jose Martinez had two RBI apiece. Right fielder Shane Billings (three hits, including a double) and left fielder J.B. Woodman each scored twice. Second baseman Andy Young led off the two-run seventh with a solo home run, his sixth long ball of 2018. Monday’s game: Evan Kruczynski (1-0, 3.38) vs. Jupiter Hammerheads, 5:30 PM Central time. Fueled by five runs in the seventh inning, the Chiefs pulled off a 6-3 victory over the Timber Rattlers. The win gave Peoria the home series sweep of Wisconsin. Starter Alvaro Seijas turned in 5 2/3 innings of one-run ball with six punchouts. Kevin Hamann finished the sixth and recorded two outs in the seventh, charged with one run and a blown save, before Levi MaVorhis took over. MaVorhis was the pitcher of record when Peoria’s bats got to work, so he picked up his first win of the year. Fabian Blanco tossed a perfect ninth to collect his first save of 2018. Contributions came from throughout the Chiefs’ batting order on Sunday, as seven of nine starters recorded at least one hit and six players batted in a run. Shortstop Taylor Bryant and first baseman Juan Yepez each had two hits – a single and a double; for Bryant, it was his second double, and Yepez’ sixth. Bryant, Yepez, left fielder Jonatan Machado, third baseman Elehuris Montero, right fielder Bryce Denton, and catcher Jonathan Rodriguez each batted in one of the team’s six runs. With offensive manufacturing done well by the Chiefs, it’s not a surprise that the team went 5-for-9 with runners in scoring position and stranded just six runners. Monday’s game: Winston Nicacio (0-0, 8.00) at Beloit Snappers, 6:30 PM Central time. On Monday, April 23 only, anyone may purchase our new 193-page 2018 Prospect Guide for less than half price. 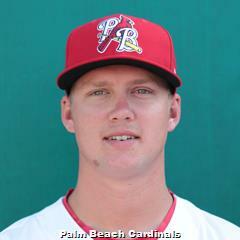 Behind Player of the Day Andy Young and starting pitcher Evan Kruczynski, Palm Beach won the only game played across the St. Louis Cardinals system on Wednesday. The infielder blasted two home runs, his fourth and fifth of the season. Results from games played on Wednesday, April 18. The Redbirds and Storm Chasers (KC) were postponed in Omaha, Nebraska, on Wednesday due to inclement weather. The two clubs will play a doubleheader on Thursday beginning at 5:05 PM Central time. 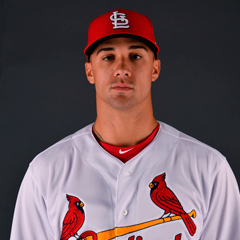 Jack Flaherty (2-0, 2.77) will start the first game for the Redbirds. Taking the ball in the nightcap will be the regular Thursday starter, Daniel Poncedeleon (1-0, 0.82). The Cardinals had a regularly-scheduled day off Wednesday and will return to action on Thursday evening. The Double-A Cards will visit the Arkansas Travelers (SEA), with the game set to begin at 7:10 PM Central time. Springfield’s starting pitcher will be right-hander Conner Greene (1-1, 3.52). 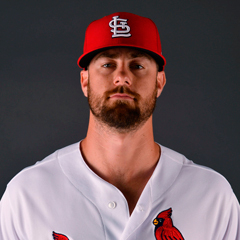 On the strength of a quality outing from their starting pitcher and an infielder who went deep twice among their 13 team hits, the Florida State League Cardinals enjoyed an 11-1 road win over the Marauders (PIT) on Wednesday. Across his six innings, starter Evan Kruczynski limited the Marauders to one run on three hits, issued just one free pass and whiffed nine batters. It was his first win of the season. Three Palm Beach relievers – Jason Zgardowski, Yeison Medina, and Will Latcham – combined to pitch the scoreless seventh, eighth, and ninth innings. Second baseman Andy Young is our Player of the Day. 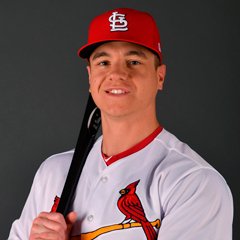 As part of his 4-for-5 evening at the dish, The Cardinal Nation’s 45th-ranked prospect powered the Beach Birds with two home runs and raised his season average to .333. Young scored three runs and batted in a trio. First baseman Stefan Trosclair and designated hitter Johan Mieses both had two hits and two RBI, including a long ball each, and Mieses scored three times. Thursday’s game: Mike O’Reilly (1-0, 0.77) at Bradenton Marauders, 6:35 PM Central time. Due to rain, the Chiefs and Quad Cities River Bandits (HOU) were postponed on Wednesday in Davenport, Iowa. This game will be made up when the Chiefs return to Modern Woodmen Park May 25-28. The current series will conclude on Thursday (weather permitting, of course) at 6:35 PM Central time. 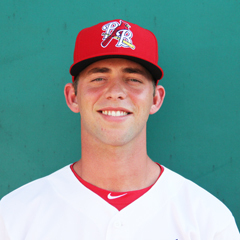 Jake Walsh (2-0, 2.61) is slated to start for the Chiefs. 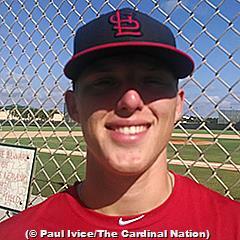 The St. Louis Cardinals system went 2-2 on Wednesday, including a double-header split by Palm Beach. 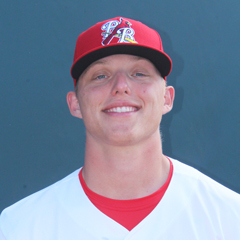 Our Player of the Day is right-hander Anthony Shew, who pitched a seven-inning complete game for the Beach Birds. Results from games played on Wednesday, April 11. Fueled by a three-run third inning and a strong performance from the pitching staff, the Redbirds were 3-2 winners over the Storm Chasers on Wednesday afternoon. Memphis improved to 6-1 on the season. With runners on first and second and two outs, Memphis designated hitter Tyler O’Neill lined a double to center, scoring both runners. Right fielder Adolis Garcia promptly followed with a double of his own, plating O’Neill to give the Redbirds a 3-0 advantage. Dakota Hudson started for the Redbirds and logged five innings of two-run ball with four strikeouts. His record moved to 2-0 through two starts this season. Arturo Reyes entered in relief and pitched a scoreless sixth and seventh. Preston Guilmet followed suit and posted zeros in the eighth and ninth. It accounted for Guilmet’s second save of the year. Thursday’s game: Austin Gomber (0-0, 4.50) vs. Omaha Storm Chasers, 7:05 PM Central time. The Springfield squad enjoyed a much-needed day off on Wednesday, a travel day that perhaps also allowed the team to clear their minds after a 1-5 road trip to start the 2018 campaign. The Cardinals will pick back up Thursday evening at 7:10 PM Central time with Ryan Helsley on the mound against Midland. Helsley is 0-1 with an 8.44 ERA. The opener of the twinbill was shortened to seven innings and the Beach Birds needed them all, breaking a 1-1 tie with a walkoff win. It was a testimony to small ball as Stefan Trosclair was hit by a pitch with one out in the home seventh. The first baseman swiped second and scored on J.B. Woodman’s single. It was the outfielder’s second hit of the game and just the fifth for the home club. Starter and Player of the Day Anthony Shew was the appropriate beneficiary, allowing just four hits, no walks and a lone run in his complete game performance. 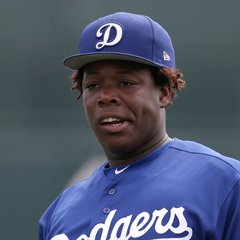 The 24-year old right-hander fanned seven in his first Florida State League win. Tuesday’s postponed game served as the doubleheader nightcap. The Cardinals couldn’t get a timely hit, as they fell to the Blue Jays by a 2-0 final score. Palm Beach tallied six hits – all singles – off the Blue Jays’ pitching staff and drew one walk. Third baseman Andy Young was responsible for two of hits, as was second baseman Jose Martinez. Nonetheless, the Cards went 0-for-4 with runners in scoring position and stranded seven men on the base paths. Ronnie Williams started and pitched 3 2/3 scoreless innings with four strikeouts and just one hit allowed. Colton Thomson followed with 1 1/3 innings, pitching through the fifth. After a lead-off walk, a sacrifice bunt, and a groundout put a runner at third with two outs, the Blue Jays came through with a base hit to break the scoreless tie. Jacob Patterson pitched a scoreless sixth inning before the Cardinals called upon Will Latcham in the top of the seventh. In the final frame, Dunedin scored its second and final run of the contest to earn the split. Thursday’s game: Mike O’Reilly (1-0, 1.93) vs. Dunedin Blue Jays, 5:30 PM Central time. In an all-around slugging match, the Chiefs came up on the short end, as the Kernels came out of top by a 12-9 score at Dozer Park. The Chiefs got off to a great start, scoring four times in their half of the first inning – including three on right fielder Dylan Carlson’s first home run of the year. Peoria also scored a run in the second, three in the fourth, and one in the bottom of the ninth, resulting from their 14 hits. Third baseman Taylor Bryant went 3-for-5 with three runs scored and an RBI double; designated hitter Yariel Gonzalez had three base hits to drive in two runs; first baseman Juan Yepez plated a pair of tallies, and catcher Dennis Ortega added a sacrifice fly in the ninth. The Chiefs combined to go 6-for-14 with runners in scoring position. It was a rough night on the pitching front, as one would imagine given the score. Starter Winston Nicasio allowed seven runs across his three-inning outing, one that spanned in to the fourth inning: Nicasio faced the first two batters of the fourth without recording an out. Kevin Hamann entered and logged 2 1/3 frames, surrendering four runs. Hamann was tagged with his first loss of the year. Bryan Dobzanski allowed one run over 2 2/3 innings, before Cory Malcom struck out the side in the ninth. Thursday’s game: Jake Walsh (1-0, 0.00) vs. Cedar Rapids Kernels, 6:30 PM Central time. The St. Louis Cardinals system was 1-2 on Sunday, with Memphis winning its fourth straight road game to open the season. 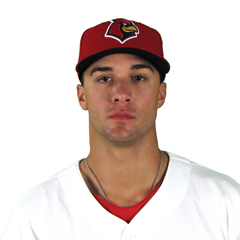 Our Player of the Day is Redbirds right-hander Jack Flaherty, who fanned 11 in seven one-run innings in the Pacific Coast League victory over Round Rock. Results from games played on Sunday, April 8. Behind their starting pitcher’s arm and left fielder’s bat, the Redbirds rolled to a 4-1 win over the Express in Round Rock on Sunday to improve to 4-0 on the season. Jack Flaherty, our Player of the Day, was masterful on the mound. Across his seven-inning outing, Flaherty limited the Express to one run on five hits and punched out 11 batters. Derian Gonzalez followed out of the bullpen with two perfect innings to earn his first Triple-A save and ensure Flaherty of his first win of 2018. 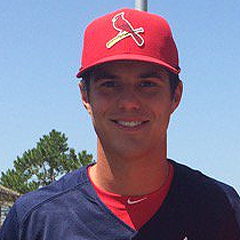 For the Redbirds at the plate, Tyler O’Neill was in the middle of the magic once again. As part of his 3-for-4 day, O’Neill smashed his fourth home run in four games and drove in three of Memphis’ four runs. Right fielder Randy Arozarena stole second base three times, taking advantage of three walks received. 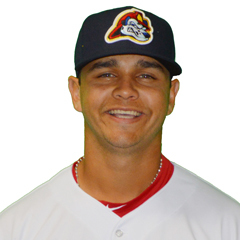 Monday’s game: Daniel Poncedeleon (0-0, 0.00) at Round Rock Express, 7:05 PM Central time. The Double-A Cardinals are still searching for their first win of 2018, as their 6-3 Sunday loss to the RoughRiders dropped their record to 0-3. 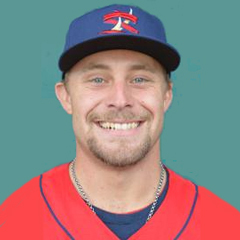 Sam Tewes was shaky in his Double-A debut, surrendering five runs (four earned) on six hits and a pair of walks in 3 2/3 innings. The bullpen pitched fairly well, though the damage was done. Hector Mendoza recorded the final out in the fourth before he posted zeroes in the fifth and sixth innings. Ramon Santos allowed a run in the eighth after logging a scoreless seventh. Despite scoring half as many runs as the RoughRiders, the Cardinals had the same number of hits, nine. They just had more trouble stringing them together. Shortstop Edmundo Sosa went 2-for-5, center fielder Lane Thomas doubled twice, and first baseman John Nogowski collected two hits. Nogowski drove in two, and catcher Andrew Knizner plated the other. 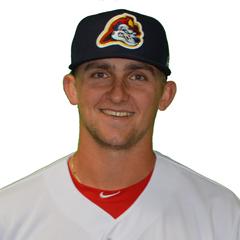 Monday’s game: Connor Jones (0-0, 0.00) at Frisco RoughRiders, 7:05 PM Central time. With three runs in the bottom of the ninth, the Hammerheads completed their comeback of eight unanswered runs to defeat the Cardinals by an 8-7 final score at Roger Dean. The Cardinals had a comfortable 7-0 lead following their half of the fifth inning. After second baseman Andy Young led off the inning with a solo shot, right fielder Johan Mieses hit a three-run homer, his second long ball as a Cardinal. The seven run cushion appeared to be more than enough for starter Austin Warner, who was mowing through the Hammerheads order – that is, until the bottom of the fifth. Jupiter put up four runs, knocking Warner out of the ballgame. Reliever Ronnie Williams recorded the first out of the ninth inning for Palm Beach, rounding off his outing of 2 1/3 scoreless frames. Jacob Patterson followed and allowed two hits before Will Latcham entered. Latcham walked his first batter to load the bases and hit the second batter to force in a run. In what would be their final pitching change of the day, the Cardinals brought in Jason Zgardowski. Zgardowski hit his first batter, tying the game, and forced in the walk-off winning run with a free pass. Monday’s game: Ian Oxnevad (0-0, 0.00) vs. Dunedin Blue Jays, 5:30 PM Central time. Due to inclement weather, Sunday’s game between the Burlington Bees and Peoria Chiefs at Dozer Park was postponed. It will be made up on Thursday, May 31 as part of a doubleheader. Monday’s game: Evan Guillory (0-0, 0.00) vs. Cedar Rapids Kernels, 6:30 PM Central time. Results for the Arizona Fall League game played on Thursday, November 16. In their final game of the 2017 Arizona Fall League season, the Surprise Saguaros defeated the Mesa Solar Sox by a 10-5 final score on Thursday. The victory gives the Saguaros a 13-17 record to close out the fall schedule. Shortstop Edmundo Sosa and center fielder Oscar Mercado started the game for Surprise. Batting second, Sosa had two singles in five at-bats and scored two of the Saguaros’ 10 runs, in the fourth and seventh innings. Third-place hitter Mercado was 1-for-5 and also came around to score in the fourth. Both hitters struck out once. Josh Lucas was the only Cardinal to appear on the mound, working the ninth inning. The tall right-hander allowed one run on back-to-back doubles but came back to strike out a batter and secure a fly to center caught by Mercado to finish the game and the regular season. The AFL Championship Game will be on Saturday at 3:00 PM Central time. The Saguaros did not qualify for the game. The Mesa Solar Sox from the East will take on the West champion Peoria Javelinas. The game will air on MLB Network. Results for the Arizona Fall League game played on Thursday, November 9. On Thursday afternoon, the Surprise Saguaros were defeated by the Glendale Desert Dogs by a 6-2 final score. The defeat drops the Saguaros record to 10-14 on the season, four games back of Peoria and tied for second place in the AFL West. 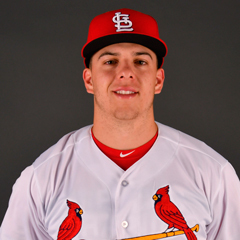 Three Cardinals started in the contest: Andrew Knizner was at first base and batted third, second-place hitter Edmundo Sosa handled shortstop duties and John Nogowski was the designated hitter while batting eighth. The latter two Cardinals accounted for both of Surprise’s runs. Sosa had one hit in five at-bats, a two-out RBI single in the third inning. For Sosa, it was his fifth run batted in of the Arizona Fall League. Nogowski had an RBI double in three at-bats with a walk. The fifth-inning two-bagger was his fourth in the AFL. Knizner had a base hit but was stranded, and speaking of stranded, he left two runners in scoring position with two outs. Overall, the Saguaros combined to go just 1-for-8 with runners in scoring position, Sosa’s hit, while stranding nine baserunners. On the pitching front, Josh Lucas was the lone St. Louis hurler of the day. The right-hander tossed a scoreless ninth with a walk. Despite two punchouts, strikes were a problem as Lucas had just eight in 17 pitches. Friday’s game: The Saguaros will head to Peoria to face the Javelinas on Friday night. The first pitch is scheduled for 8:35 PM Central time with Sandy Alcantara (0-2, 5.73) taking the ball for Surprise. Results for the Arizona Fall League game played on Thursday, November 2. With two runs in the bottom of the 10th inning, the Mesa Solar Sox enjoyed an 8-6 walk-off win over the Surprise Saguaros on Thursday. The loss drops the Saguaros’ record to 8-12 on the AFL season. 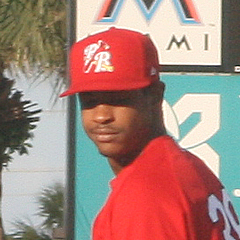 Left fielder Oscar Mercado was the only St. Louis Cardinals’ starter in the contest. Mercado was hitless in three at-bats, though he did drive in a run with a sacrifice fly – his fifth run batted in of the season. Jordan Hicks was the lone St. Louis pitcher to appear on Thursday. Hicks logged a scoreless fourth inning, on a hit, a walk and a pair of strikeouts. Edmundo Sosa entered in the ninth inning as a pinch-runner and appeared defensively at third base, but despite not having a plate appearance, he was prominent in the action. 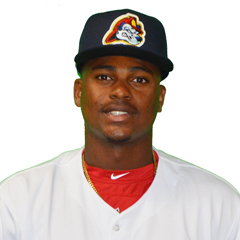 Under Experimental Rules being used in the AFL, Sosa was placed on second to open the 10th, representing the prospective lead run. After moving up to third, Sosa was erased at home on a fielders’ choice grounder (see photo). The home club ended the contest in the bottom of the inning on a walk-off two-run home run by Oakland’s Sheldon Neuse. That pinned the loss on Surprise’s Jacob Bodner (KC). For what it is worth, only the home run score was earned, not the extra runner on second. Friday’s game: The Saguaros will host the Salt River Rafters at 2:35 PM Central time. Starting for Surprise will be Ryan Eades (MIN) (2-0, 0.00). Results for the Arizona Fall League game played on Tuesday, October 31. The Surprise Saguaros were rocked by the Peoria Javelinas in Tuesday’s 9-2 home loss. As a result, the Saguaros are now 8-10 during the Arizona Fall League season. 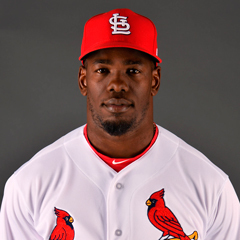 Two St. Louis Cardinals position players started in Tuesday’s contest and played the entire game: shortstop Edmundo Sosa, batting second, and the fifth-place hitter, first baseman John Nogowski. In the home first, Sosa singled softly to center (the first of his team’s four meager hits on the day) but was picked off first base and thrown out easily at second. He grounded out twice and flied out in his other at-bats. Nogowski went 0-for-4. His outs were diverse with a strikeout, ground out, fly out and an infield chopper turned into a double play. Arturo Reyes was the only Cardinals pitcher to take the mound for Surprise. Reyes worked in the ninth inning and allowed two runs on the final three hits of the Javelinas’ 15 mustered in the game. In addition to the three singles yielded, Reyes threw a wild pitch and allowed a sacrifice fly. Wednesday’s game: Surprise will host the Mesa Solar Sox on Wednesday afternoon, with a 2:30 PM Central time first pitch. Starting for Surprise will be Burch Smith (TB) (0-1, 7.56). Results for the Arizona Fall League game played on Thursday, October 26. The Surprise Saguaros dropped Thursday’s home contest to the Glendale Desert Dogs by a 10-5 final score. The loss sets Surprise’s record at 7-7 on the season. 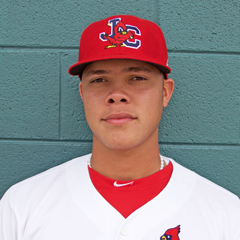 Cardinals pitcher Jordan Hicks gave up four runs across the fifth and sixth innings, leading to his second loss and first blown save of the AFL season. The big blow of Hicks’ outing was a three-run homer with one out in the fifth, allowing the Desert Dogs to pull ahead of the Saguaros for good. Overall, the right-hander allowed five hits, one walk and fanned three. His AFL ERA ballooned to 11.42. Three St. Louis position players appeared in Thursday’s contest. 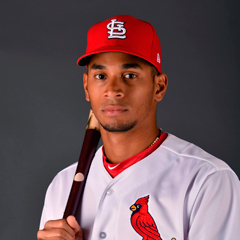 Center fielder Oscar Mercado led off for Surprise and was on base four times in five plate appearances, with two base hits and two walks. However, his teammates could not get him home. Mercado’s AFL on-base percentage is .489 through 10 games. Cleanup hitter Andrew Knizner played at first base. Knizner had a base hit in five at-bats, and came around to score, but grounded into two double plays. Moved up to the seventh spot, Edmundo Sosa responded with a single and triple in four at-bats. The shortstop drove in a run and scored another. Friday’s game: Surprise at Scottsdale, Zach Lovvorn (KC) (1-0, 0.00), 12:35 p.m. MT. Results for the Arizona Fall League game played on Tuesday, October 24. Withstanding a three-run rally in the ninth inning by the home team, the Surprise Saguaros held on for a 4-3 Tuesday victory over the Salt River Rafters. With the win, the Saguaros are 6-6 this season. Cardinals reliever Arturo Reyes was on the mound when the Rafters scored three times in the bottom of the ninth, as he allowed five consecutive hits – including two doubles, a triple along with a stolen base. All the damage was done with no outs before Reyes buckled down with a strikeout-lineout-strikeout to end the game and strand the tying run in scoring position. This was the first time the right-hander was scored upon in five AFL outings. John Nogowski started at first base for the Saguaros and the number six hitter went 1-for-3 with a double, a run batted in, a walk, and two runs scored. His second run, in the top of the ninth, turned out to be especially important as it became the winning margin. 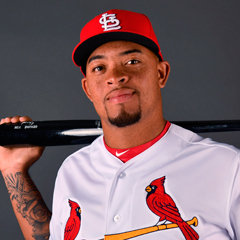 The other Cardinals position player involved in Tuesday’s action was shortstop Edmundo Sosa, who had a seventh inning single in four at-bats from the eight hole. Results for the Arizona Fall League game played on Thursday, October 19. The Surprise Saguaros fell to the Mesa Solar Sox in 10 innings on Thursday by a 6-4 final score. The Saguaros are now 4-5, including a 1-4 record at home. Surprise went 3-for-14 with runners in scoring position in the loss. With the lack of timely hitting, the Saguaros finished the day with 10 runners left on base. Three Cardinals position players appeared in the contest. Out of the number eight spot, shortstop Edmundo Sosa had a base hit and scored a run. First baseman Andrew Knizner went 1-for-4, an RBI single – his fourth run driven in during the Arizona Fall League. The cleanup hitter also drew a free pass. Center fielder Oscar Mercado was busy, reaching base four times in five plate appearances, on a single and three walks. Mercado stole his first two bases in the AFL, but was also picked off once. His teammates were able to bring the number three hitter home just one time. 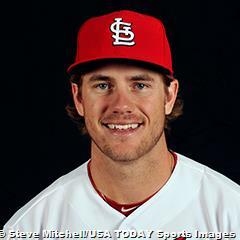 Josh Lucas was the only St. Louis hurler to enter Thursday’s game. Lucas surrendered two runs in the top of the 10th inning, including a solo home run. In his rough outing, the right-hander also uncorked a wild pitch, allowed a single and walked a batter. Lucas took his first loss of the AFL season to drop to 0-1. 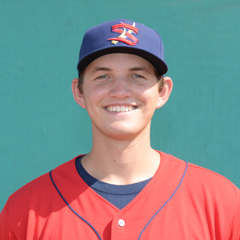 Friday’s game: Surprise at Mesa Solar Sox, Zach Lovvorn (KC) (1-0, 0.00), 12:35 p.m. MT. Results for the Arizona Fall League game played on Tuesday, October 17. Fueled by a pair of four-run frames, the Surprise Saguaros were 10-3 winners over the Peoria Javelinas on Tuesday afternoon. The Saguaros are now 4-3. Three Cardinals position players appeared in Tuesday’s action. John Nogowski went 2-for-5 with a double and a run scored as the Saguaros’ designated hitter, and shortstop Edmundo Sosa had a base hit in three at-bats. Catcher Andrew Knizner led the way with a 4-for-5 performance, featuring a double, a run scored, and a run batted in. On the pitching front, St. Louis had three hurlers take the mound. Arturo Reyes had another strong outing, pitching a scoreless third inning and posting a zero in the fourth as well with two strikeouts. Jordan Hicks also logged two frames, striking out three and allowing a walk and two hits, including a solo homer in the seventh. Josh Lucas sealed the Surprise win with a walk and a strikeout in the ninth inning. Results for the game played on Thursday, October 12. The Surprise Saguaros dropped Thursday’s game in Glendale to the Desert Dogs by an 8-2 final score. The Saguaros are now 1-2 to start the season. Glendale set the tone with three runs in the bottom of the first and added on five more as the game progressed, including two in the eighth. None of the Cardinals pitchers – Sandy Alcantara, Jordan Hicks, Arturo Reyes and Josh Lucas – appeared in Thursday’s contest, but three of the team’s four position-player representatives were in on the action. Only Edmundo Sosa sat out. Batting third, center fielder Oscar Mercado went 1-for-4 with a single, and catcher Andrew Knizner had a base hit in one of his three at-bats out of the seventh spot. The Saguaros will take on the Desert Dogs again on Friday, only the two teams will square off at Surprise Stadium. First pitch is scheduled for 2:35 PM Central time. Results for the game played on Tuesday, October 10. In the first game of the 2017 Arizona Fall League season, the Surprise Saguaros fell to the Salt River Rafters on Tuesday by a 4-3 final score. 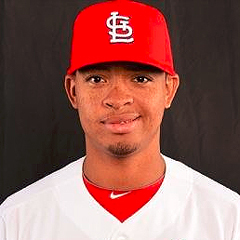 Cardinals right-hander Sandy Alcantara started for the Saguaros and allowed three earned runs on four hits and two walks in his two-inning outing. The hard-thrower did not register a strikeout. 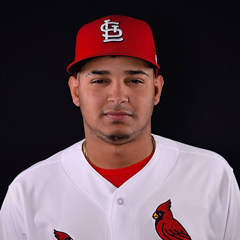 In relief of Alcantara, who took the loss, Cardinals farmhand Arturo Reyes tossed two scoreless innings before fellow Cardinal Jordan Hicks surrendered an unearned run in the sixth, his second of two innings on the mound. Reyes and Hicks each yielded three hits and no walks. Hicks fanned one. Josh Lucas struck out two batters in a 1-2-3 ninth. The unearned run came as the result of an error – committed by Cardinals center fielder Oscar Mercado. It’s worth mentioning that Mercado, despite the fielding error, had two timely outfield assists. Mercado was the only Cardinals position player to appear in Tuesday’s game. The number three hitter went 2-for-5, including an RBI single. 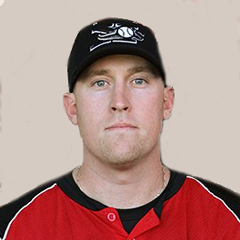 Wednesday’s game: Surprise at Salt River, David Ledbetter (TEX) vs. Scott Squier (MIA), 6:35 p.m. The Memphis Redbirds took Game 1 of the Pacific Coast League finals over El Paso Wednesday night. Player of the Day Patrick Wisdom plated two runs on doubles. Results for the game played Wednesday, September 13. With the opening game of the Pacific Coast League Championship Series pushed back due to inclement weather on Tuesday, the Memphis Redbirds enjoyed a 6-4 win in the first game on Wednesday over the El Paso Chihuahuas. Memphis first baseman Patrick Wisdom, our Player of the Day, went 2-for-3 at the plate with a pair of doubles, two runs batted in, and as many runs scored. Left fielder Nick Martini scored two runs and center fielder Tyler O’Neill belted his fourth home run of the postseason. The Redbirds stranded nine runners on base, but their half-dozen runs were enough — thanks to quality pitching. Redbirds starter Dakota Hudson logged six innings of two-run ball, striking out five batters along the way. Hudson allowed both runs in the fourth, an inning that ended prematurely for the Chihuahuas: former Cardinals backstop and current Padres farmhand Tony Cruz was picked off second base to end a two-on, two-out threat. Hudson ultimately picked up his second win of the postseason. In relief of Hudson, Sean Gilmartin pitched a scoreless seventh. Mark Montgomery got into trouble in the eighth, surrendering two El Paso runs and recording just one out to bring the visitors to within two. Closer Josh Lucas increased the tension by allowing a single and walk to load the bases before escaping the jam unscathed. He then worked a quick ninth inning with two strikeouts to pick up the five-out save. The Redbirds need two more wins to take their first PCL title since 2009. The second game of the Finals will be played 12:05 PM Central time on Thursday at AutoZone Park in Memphis, Tennessee. Following Game Two, the two clubs will travel to El Paso, Texas, to wrap up the best-of-five series on Friday through Sunday, as needed. 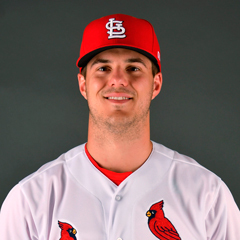 Kevin Herget will start for the Redbirds on Thursday. Herget pitched well (5 IP, 6 H, 3 R, 1 ER, 2 BB, 3 Ks) in his start against the Colorado Springs Sky Sox earlier this postseason, but he took a tough-luck loss.